The Venezuelan government keeps silence about the Venezuelan Boeing 727 that (was) crashed in Mali after it had downloaded a lot of cocaine. The German Deutsche Welle tells us the president of Mali, Amadou Toumani Touré finally talked about this incident. He talked on a state TV broadcast in the middle of the night as soon as he got back from a trip to Lybia and Qatar. He said he had not talked earlier because he did not want to hinder the investigations. 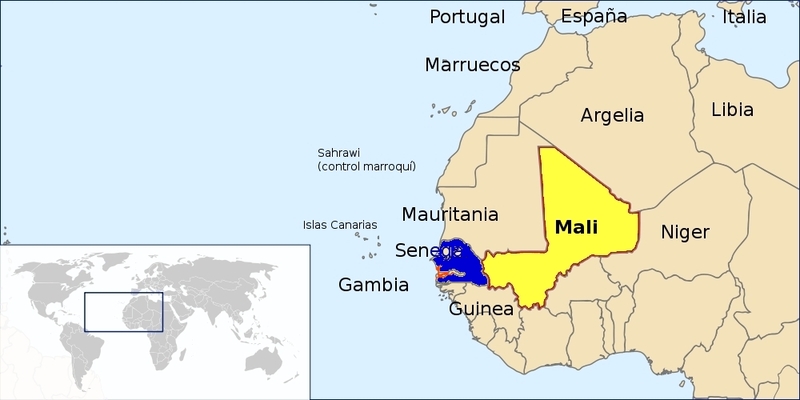 Touré added the Mali government is collaborating with the neighbours and transmitted information to Interpol. How long are we going to have to wait to know more details about that plane? From what airport in Venezuela did it set off? Stay tuned. Now, you may be wondering what Tibisay Lucena, the top woman of the Venezuelan Electoral commission has to do with Mali. I know one of my great-great-grandmothers came from somewhere in Western Africa, but what about Tibi? Was she on a kind of Roots trip? 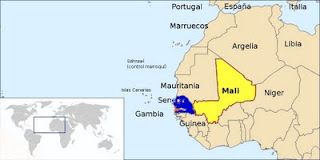 Well, if you read French or use Google tools to read it, you can go to a site of the Malian government here and read about Tibi's visit to Mali, Senegal and Guinea-Bisseau in April of this year. Or you just go and see the picture of Tibi, Venezuela's business representative in Mali and some Mali functionaries testing one of those machines. The visit was no secret in Venezuela. I read about it in a couple of Venezuelan newspapers and in pro-Hugo grassroot site Aporrea. As the propaganda site Venezuelanalysis reported back then, the lady in red went to those countries "to share the experience that Venezuela has accumulated over the past ten years with our friends". 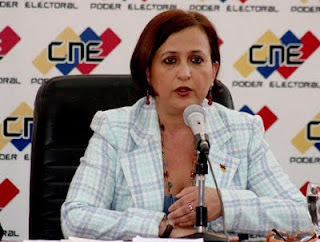 She wanted to show basically how the Venezuelan voting machines work...or don't work. If you have followed this blog you may know the world's most modern voting system is much slower than manual systems and you may know the paper trail it produces often does not show what the voter actually wanted. Never mind, what is good for a Venezuelan is good for our friends in Africa as well. From an earlier post you know Hugo has a very particular interest in those three countries in Africa. In July of 2009 the Guinea-Bisseau police seized a plane with 500 kl. of cocaine with a Venezuelan crew. There was a standoff as the Guinean military tried to stop the police from doing its work. That was not the first time and it won't be the last one. You can read a lot about Guinea-Bisseau's links to drugs trade in The Telegraph. You can read a little bit about some cocaine seizures in Senegal here and here. By the way, Ahmadinejad headed to Senegal after he left Venezuela. He is trying to build up ties there. the Venezuelan government should work openly with United Nations to clarify how the cocaine is going from colombia through Venezuela to those three countries. Now the Venezuelan government can say I am creating a "matriz de opinion". So be it. Just be more transparent.